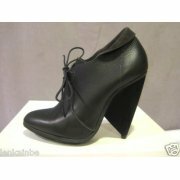 I first noticed a pair of cone heels back when I was working at Victoria’s Secret Direct (VSD), my first “big girl” job. It was my responsibility to know all of the Victoria’s Secret catalogues and their website. Since then, I’ve realized that the cone heel is my favorite type of heel there is. I love how it starts off with a wide, solid base and is ultimately whittled down to nearly nothing at all. It incorporates the careful balancing act of the stilleto point yet offers the security of a wedge heel for backup. A lot of times although the heel isn’t that high, it looks moderately high, which makes them pretty comfortable to walk in. « Kenny’s Korner, Featuring Cornel West….